Holidays in Bulgaria, how to get known and famous resorts of Sunny Beach, Golden Sands, Lake Balaton. 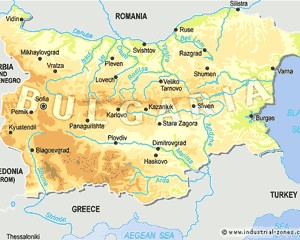 Bulgaria is situated on the Balkan Peninsula and is part of South-eastern Europe. The occupied territory is 110,993.6 km ² Common border with the countries: in the north - is bordered by Romania, in the south - with Turkey and Greece to the west - with Serbia and Macedonia, on the east by the Black Sea, which connects Bulgaria with Russia, Ukraine and Georgia. The total length of the Black Sea coast 378 km (240 miles), and the length of the border - 2245 km, including 686 km - river and 378 miles - the sea border. Ethnic groups: Field info displayed for all countries in alpha order. Bulgarian 76.9%, Turk 8%, Roma 4.4%, other 0.7%. Mountain is part of the Alpine and Himalayan chain, as well as the Macedonian mountain range. A vast plain oblastk) is the Danube hilly plain situated in northern Bulgaria. For the Black Sea coast of Bulgaria is characterized by high length of the beach, intermittent cliffs. On the territory of Bulgaria takes 526 rivers, and almost all of them descend from the mountains and flow into the Black and Aegean seas. Main-Danube navigable river, flowing near the northern border of Bulgaria. Travel industry slowly begins to develop new tours and entertainment for tourists: rafting rafting and canoeing on mountain rivers, swimming in waterfalls, hang-gliding and paragliding in the river valleys. The longest river in Bulgaria: Iskar (368 km), Tundjia (349.5 km), Maritsa (321.6 km), Osama (341.0 km), Struma (290.0 km), Yantra (285,5 km), Kamchia (244.5 km), Arda (241.3 km), Auda Kamchia (200.9 km), Russenski Lom (196.9 km). Across the country about 330 lakes. The largest lakes near the Black Sea-Alepu, Arkutino, Pomorie, Beloslav, Burgas, Varna and Lake Shabla. Lakeland calls 260 glacial lakes, which lie in the mountain ranges of Rila and Pirin. The Black Sea coast of Bulgaria is divided into north and south. In the northern part of the resorts of Golden Sands and Albena, and in the south - Sunny Beach. Bulgarian Black Sea coast is perhaps the most pure in Europe: many of its beaches are decorated with blue flag - the international environmental "quality mark". In summer the sea water warms up to 25C and the air temperature here rarely exceeds 28C. So even Air conditioning in rooms, so necessary in the summer in the Mediterranean in Bulgaria is not necessary - the coast is constantly blowing a refreshing breeze. The sea is very clean, with a flat bottom, not knowing ebbs and flows, and the fine sand and golden. If we talk about the number of new or renovated hotels, Bulgaria is far ahead of several countries on the Black Sea. In addition, holiday in Bulgaria - it is easy to communicate with the locals. Prices for tours to Bulgaria and please do stay in Bulgaria not only enjoyable, but also economical. The holiday season in Bulgaria starts in April. Tours in Bulgaria include the most popular Black Sea resorts: Golden Sands, Sunny Beach and Albena. Tours in Bulgaria will not be bored of the brain and spirit. Tours in Bulgaria will be pleased with the curious holiday-worthy attention to landmarks. For example, the rock monastery of 14 th century Aladja to "Golden Sands". Or the ancient town of Balchik, which is based in the 5 th century BC. er. This means that even if hydrogen sulfide sources or spa treatment centers will seem too boring alternative to beach volleyball holidays in Bulgaria provides an opportunity to break from the sea landscape somewhere in the ruins of ancient fortresses and Thracian tombs. Golden Sands Bulgaria draw in the first place a very mild climate and relatively low prices. Golden Sands - melkopeschany best beach on the coast of the Black Sea (up to 200 m). Golden Sands - the most fashionable resort in the country. Sea off the coast of a shallow, bottom of a clean, warm water. No jellyfish or sharks or piranhas. Only the rustle of the surf and birds in the clear sky. Sunny Beach the biggest sea resort in Bulgaria. The beach is located between the cities of Varna and Burgas, and is part of Nessebar, oldest part of which is included in the list of UNESCO World Heritage sites in Bulgaria. Sunny Beach - a long strip of fine golden sand. On one side of the sea beach, on the other side - high sand dunes. Resort Albena is located in the beautiful bay of the northern Bulgarian Black Sea coast. In April, there is still a bit chilly, but the starting May, temperatures can soar to 21 degrees. Albena - one of the first private resorts in Bulgaria. Hotels in Albena Situated directly on the sandy strip, near the Natural Reserve "Balata", or in the nearby hills. Here you can lechat.A and so - liquor, paraffin, and massage. Holidays in Bulgaria can not do without a visit to Sofia, one of the oldest cities in Europe. Tours in Bulgaria offers the opportunity to find the echoes of all eras. Antiquity is represented by the Roman forum in Plovdiv and many other monuments and remains of monuments. Middle Ages - numerous churches and monasteries. New time - the monuments, which testify against the Bulgarians from Turkish rule. There is something to see. Bulgaria - a very friendly country to visit in Bulgaria - a south sea, pleasant smiling people.